For singer Slim Gaillard, his instrument was less his voice than the language styling he used while performing. A common trait of the great Jazzmen was absolute, if unconventional, mastery of their instruments. For singer Slim Gaillard, his instrument was less his voice than the language styling he used while performing. Slim even invented his own language, called "Vout". Although made up of seemingly nonsensical words, Slim made an entire dictionary of Vout words and expressions over the years. Gaillard's linguistic talents developed through necessity as a youth. The official records say he was born in Detroit, Michigan, 1916, but he claimed to be a native of Santa Clara, Cuba. His mother was an Afro-Cuban beauty, and as a youngster, Gaillard was occasionally allowed to sail with his father, a German-Jewish steward working on a steamship. When he was 12-years-old, Gaillard went ashore on the island of Crete and the ship sailed without him. He picked up a few words of Greek, working as a shoemaker's assistant, and was eventually hired on a ship working in the Eastern Mediterranean. Finally, after turning fifteen, he signed onto a ship crossing the Atlantic. The boat stopped in New York, but he stayed aboard until arriving in Detroit. There were thriving Greek and Arab communities in the Motor City where Gaillard fit in. He tried to get a job with Ford but was turned away for being too young. Instead, he worked odd jobs, including prize-fighting and driving a hearse filled with bootleg rum for the Purple Gang. While he was working for the Purples, Gaillard was able to take music lessons in the evening. When Duke Ellington came through town, Gaillard used his connections to get backstage meet the Jazz great who encouraged him and praised his formal music studies. With this encouragement, Gaillard moved to New York where he worked the "professional amateur" vaudeville circuit, shifting his act from tap-dancing to guitar to singing to boogie-woogie piano to appeal to the amateur-show fans. 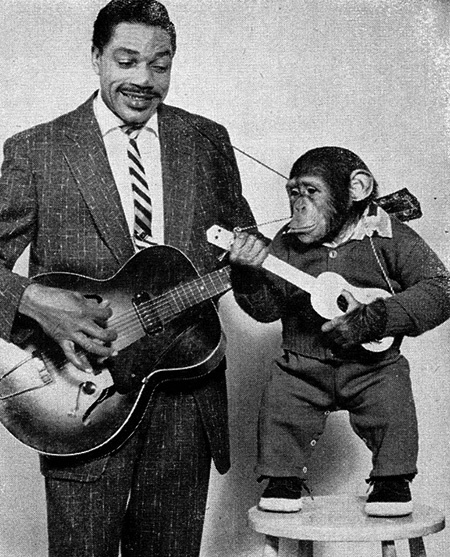 He eventually teamed with bassist Slam Stewart to form the Jazz-novelty act "Slim & Slam" and they had a hit with "Flat Foot Floogie (with a Floy Floy)". The act broke up when both men were drafted in 1943 and Slim qualified as a B-26 pilot in the Pacific. After mustering out, Gaillard's popularity began to increase with the rising popularity of Bebop. He took a long break from music in the sixties, managing a hotel in San Diego for a time and buying an orchard near Tacoma, Washington. In 1982, Dizzy Gillespie convinced Gaillard to travel to Europe and begin touring and recording again. 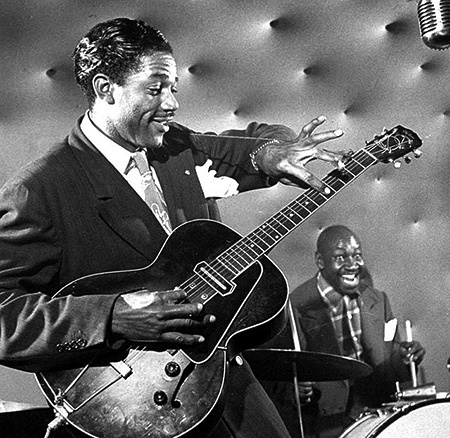 He became the toast of the London Jazz scene where he settled until succumbing to cancer on February 26, 1991. Be the first to comment on "Slim Gaillard"